Today I was ought to make a public presentation at Eleonora. On the open deck and accompanied by the great evening weather I’ve decided to talk not just about the past and present but also about the future. 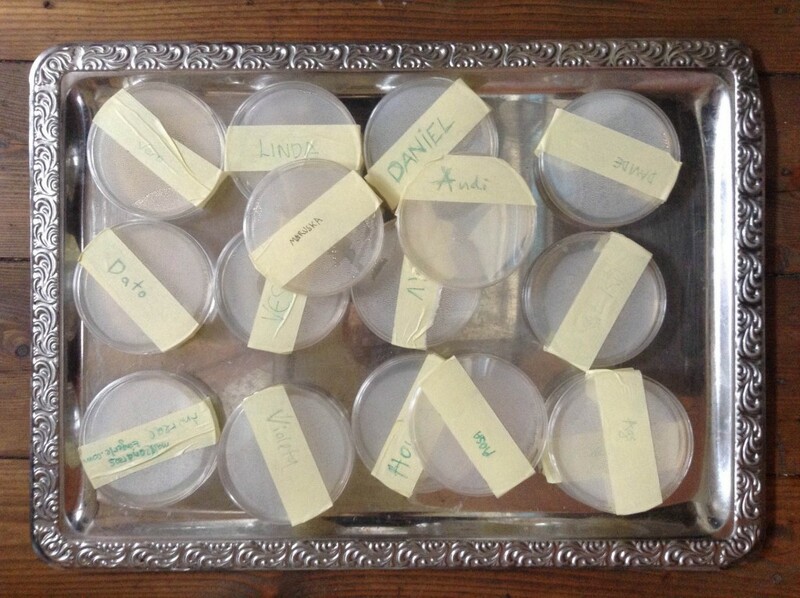 Therefore I invited people to leave whatever of their personal bacterias on previously prepared Petri dishes. As every fermentation involves bacterias I see storing, growing and interpreting bacterias as totally relevant to Ferment Lab theme. After incubation I’ve promised to read the future from shapes of grown colonies using methodology based on tea-cup reading and fortune-telling by tea leaves. The idea for it lays somewhere between http://www.wikihow.com/Grow-Bacteria-in-a-Petri-Dish and http://www.gutenberg.org/files/18241/18241-h/18241-h.htm.